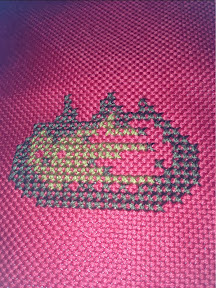 StitchyDonDesigns: Crazy January Challenge: Day Four and Happy Bloggiversay to Me !!!! Crazy January Challenge: Day Four and Happy Bloggiversay to Me !!!! It's my third year bloggiversay today, I can't believe I've stuck at it for this long !!! Thank you to everyone who follows me, I really appreciate each and everyone of you. It's true that some projects (especially the linen butterfly one) just wouldn't have been completed without your support, thank you !!!! I will do a small giveaway towards the end of January, once work settles down a bit. I work in retail and as you can imagine its a little nutty working at the moment !!! The fabric is red but it's dark and the photo was taken on my phone, however you get the idea. Congrats on 3 years of blogging! That looks like a lot of stitching. It's really hard to take a picture of red fabric and have it look right. I'm sure it will look yummy! Stitch From Stash January Edition !!! Trick or Treat Update !! Crazy January Challenge: Day Eight ! Crazy January Challenge: Day Two ! !